Tropical cyclone track prediction is steadily improving, while storm intensity prediction has seen little progress in the last quarter century. 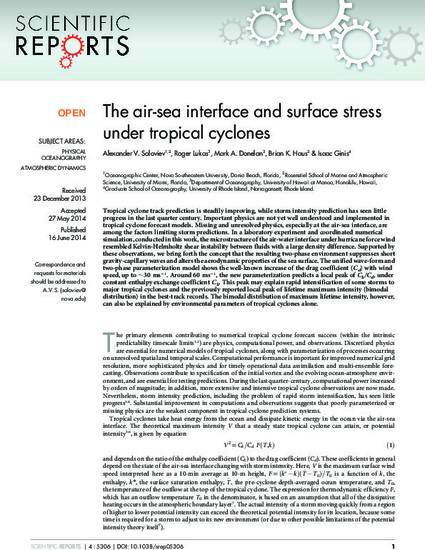 Important physics are not yet well understood and implemented in tropical cyclone forecast models. Missing and unresolved physics, especially at the air-sea interface, are among the factors limiting storm predictions. In a laboratory experiment and coordinated numerical simulation, conducted in this work, the microstructure of the air-water interface under hurricane force wind resembled Kelvin-Helmholtz shear instability between fluids with a large density difference. Supported by these observations, we bring forth the concept that the resulting two-phase environment suppresses short gravity-capillary waves and alters the aerodynamic properties of the sea surface. The unified wave-form and two-phase parameterization model shows the well-known increase of the drag coefficient (Cd) with wind speed, up to ~30 ms−1. Around 60 ms−1, the new parameterization predicts a local peak of Ck/Cd, under constant enthalpy exchange coefficient Ck. This peak may explain rapid intensification of some storms to major tropical cyclones and the previously reported local peak of lifetime maximum intensity (bimodal distribution) in the best-track records. The bimodal distribution of maximum lifetime intensity, however, can also be explained by environmental parameters of tropical cyclones alone.